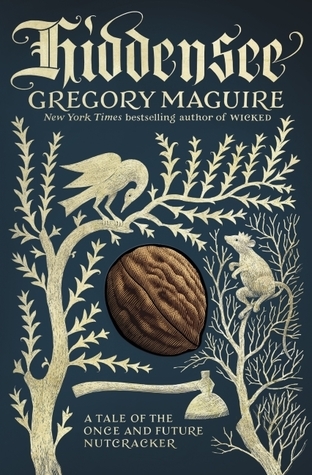 Hiddensee: A Tale of the Once and Future Nutcracker by Gregory Maguire. William Morrow, 2017. Hardcover. 304 pages. If you're not already aware, Gregory Maguire is also the author of Wicked, which, you know, is a little popular. I've never read Wicked (but I've seen the play!) and I have heard so many mixed opinions about Maguire's writing. Some people love it, but a lot seem to hate it. I don't know how similar in styles Hiddensee is to Wicked, but from reading through Hiddensee I can understand why some people dislike his writing style, as it is certainly distinct... but I really like it. Hiddensee is a very unique tale that aims to tell a story about the Nutcracker and his toy maker, Dirk Drosselmeier. This story ended being more about Drosselmeier than the nutcracker, which was honestly slightly disappointing to me. I was expecting something more magical in its telling and focused on the nutcracker's story. Despite this, I was still very engaged in Drosselmeier's story and still found an abundance of elegance in his writing. The most engaging aspect of this book is simply Maguire's prose. It is truly gorgeous and it is apparent that he has a natural gift for crafting lovely sentences and phrases. Something that I particularly liked about Maguire's writing was how he manages to combine fairy-tale based atmospheres and imagery with regular human life in a way that meshes together really well. In addition to this, all of Maguire's characters are delightfully crafted, with some that I loved, some I hated, and some I that I could never really decide upon my feelings towards. Drosselmeier himself is an peculiar character that I enjoyed following and discovering his backstory and the many odd events of his life. Hiddensee can be slightly hard to follow at times, but for me that was made up for by the intriguing manner in which this book is written. It's a dark story, which I expected and was happy with how Maguire seemed to handle keeping this darkness present. There are also small moments of humour interspersed, nothing overbearing, but just enough to allow the reader to connect with the story. The only downside is that I felt that things were left a little too uncertain at times. I generally enjoy books with uncertainty and incomplete endings, but sometimes I just felt too lost or unsure and it did take away some of my enjoyment. This is also due to the book being a bit slow at parts, and if you're looking for the Nutcracker-focused moments you'll have to wait til the last part of the book. Things get a bit confusing at various moments, but I was always able to re-orient myself and enjoy the book again. However, even when I was confused I still found myself immersed in Maguire's writing. After reading Hiddensee, I definitely think that I'll be giving Wicked a shot sometimes. Overall, I've given Hiddensee four stars!